A native of Fargo, North Dakota, violinist Madeline Capistran began studying violin at age 9 with her mother, Jane Linde Capistran. As a teenager, she continued her studies with Sally O’Reilly at the University of Minnesota. Ms. Capistran holds a B.M. in violin performance from Michigan State Uniersity and an M.M. in violin performance from DePaul University, where she studied with Ilya Kaler. As an active orchestral and chamber musician, Ms. Capistran was a member of the Civic Orchestra of Chicago for two seasons, the Fargo-Moorhead Symphony for four seasons, and has attended such summer programs as Musicorda, Meadowmount, the Colorado College Summer Music Festival, the Hot Springs Music Festival, Dakota Chamber Music, and the University of Nebraska-Lincoln Chamber Music Institute. She has performed in master classes for the St. Lawrence String Quartet and Janet Sung, and has appeared as part of the “Noontime Concert Series” at the University of Chicago. As a soloist, Ms. Capistran has performed with the Fargo-Moorhead Symphony, the Fargo-Moorhead Area Youth Symphony, on National Public Radio’s show “From the Top” with pianist Christopher O’Riley, and recently with Chicago’s Logan Chamber Players. 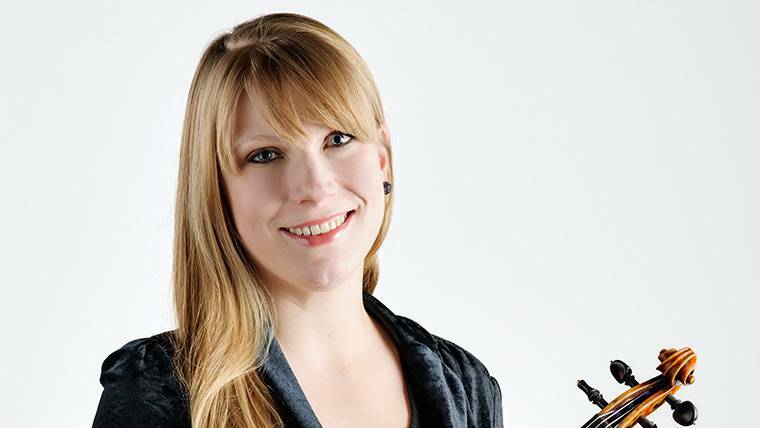 Ms. Capistran is also in her second season as Assistant Concertmaster of Orchestra Iowa in Cedar Rapids, IA. She is currently living in Chicago where she teaches, free-lances, and performs regularly with such groups as the New Millenium Orchestra, Access Contemporary Music, and as concertmaster of Chamber Opera Chicago. Performing Rite of Spring with the Ballet last season. My mother is a violinist and was my very first teacher. I had already been playing piano for a few years, but I asked her if I could start playing the violin when I was nine years old. My biggest musical inspiration would have to be my mom. She is a wonderful violinist, teacher, and conductor, and really loves what she does. My former teacher, Ilya Kaler, has also been a very inspiring musical presence in my life. I took a linguistics class when I was in college, and I thought it was one of the most fascinating things that I had ever studied. I thought that becoming a linguistics professor could have been an interesting career . However, I did have a pretty big interest in becoming a hair stylist when I was four years old, so that is another possibility!